As one of the most popular dinner shows in Branson, Dolly Parton’s Dixie Stampede Dinner & Show will surely make your Christmas vacation a wonderful one. 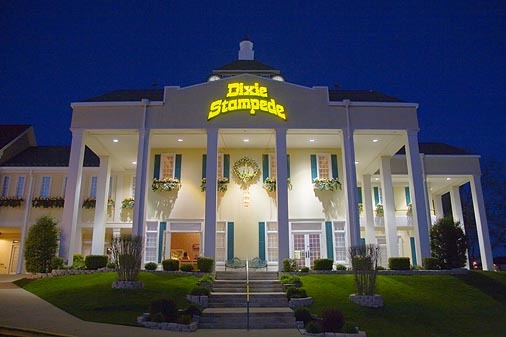 Dixie Stampede is not just the most fun place to eat in Branson, it is also the world’s most visited dinner attraction. Come celebrate the American spirit with inspiring powerful performance featuring 32 magnificent horses and cast of top-notch trick riders in a 35,000 square foot arena. Watch the friendly North and South competition as it showcases horse riding stunts at top speeds, spectacular special effects, phenomenal musical productions all while you are served with delicious four-course dinner. Dixie Stampede Dinner & Show combines world-class entertainment and fantastic four-course dining experience. In addition to the main event, every ticket to the show includes pre-show entertainment inside the famous Carriage Room featuring the show’s opening act where the entire family can enjoy the fun and excitement. Just minutes from famous attractions in the heart of Branson, Dixie Stampede Dinner & Show brings you different talents in such a family-friendly atmosphere. You’re sure to see the show again the next time you visit Branson. After you have enjoyed on the fabulous Carriage Room Opening Act and now comfortably seated in the incredible 35,000 square foot main arena, it’s time to enjoy the main event with a big feast. You’ll be served a full four-course meal with a satisfying home-cooking and mouth-watering treats as the action begins. The four-course feasts include a mouth-watering Tender Whole Rotisserie Chicken, Delicious Hickory Smoked Barbecue Pork Loin, Dixie Stampede’s Original Creamy Vegetable Soup, Scrumptious Homemade Biscuit, Hot Buttered Corn on the Cob, Tasty Herb-basted Potato, Dixie’s very own Specialty Dessert, and unlimited soft drinks, tea or coffee. For vegetarian and gluten free guests, you still enjoy scrumptious dinner complete with all the trimmings that includes Country Garden Vegetable Pasta, Dixie Stampede’s Original Creamy Vegetable Soup, Scrumptious Homemade Biscuit, Hot Buttered Corn on the Cob, Tasty Herb-basted Potato, Dixie’s very own Specialty Dessert, and unlimited soft drinks, tea or coffee. If you wish to receive a vegetarian meal, please notify them when making reservations. To start the fun and excitement, you will see the fierce competitors and their beautiful horses. You will see them in a number of challenges including pig races, carriage racing, lumberjack relays, and barrel racing. While the show is going on, you’ll be experiencing the comedy of the cowboy Skeeter or enjoying a waltzing performance by the ‘Belles of the Ball.’ If that is not enough, you’ll even get to see a real buffalo stampede. At the end of the show, a patriotic finale act is themed in sparkling red, white and blue. Dolly Parton is just right when she claims that Dixie Stampede is the most fun place to eat in Branson. If you want to enjoy the fun and excitement in one of the most visited dinner shows in Branson, don’t miss to watch Dolly Parton’s Dixie Stampede Dinner & Show in Branson.